← The Concept of Money Speed. Fast and Slow Money. In the “About” posting I write. So we all do know what really matters even without going too deeply into questions of economics. Yet when it comes to questions of waste, the phrase “waste of money” is much more common than “waste of resources”. MMT is particularly good, IMO , at showing how economic problems, like high unemployment, which are usually associated with a lack of money can be effectively tackled. Economic problems which arise from a lack of resources are much harder to solve. No economy can be run perfectly and some waste is inevitable. It would seem to be a ‘no brainer’ that we should err on the side of minimising waste of resources. It is a pity the leaders of modern day Europe don’t seem to see it quite like that. In the previous posting “A looming demographic time bomb” I make the argument that the present generation of elderly potential retirees will be dependent on the abilities of younger workers to maintain them in their latter years. Stored government IOUs aren’t going to make any real difference. And yet in parts of Europe youth unemployment is as high as 70%. What could be a worse waste of resources than this? The very people who will be relied on to keep the economic wheels turning in ten or twenty years time are presently languishing in the despair of austerity economics. Saving money is the only political imperative. Even if we ignore the injustice of it all, and the loss to their communities of the results of the useful work they could perform, it is hard to see how years of enforced idleness can be the best preparation. The Mark Twain library in Detroit as it was photographed recently. What a waste. 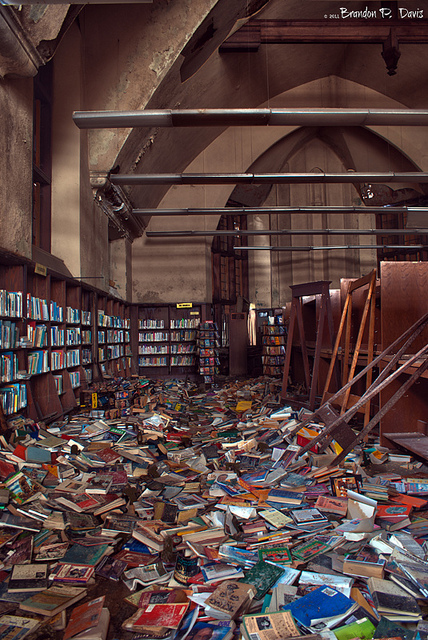 An entire library, full of books just allowed to rot. I should perhaps just say that books are a commodity rather than a resource. Books contain their value, both in use and exchange value terms, as the sum of the stored labour involved in their production and the use value supplied by nature in the raw materials necessary for their production. It may seem obvious but it is worth just noting that human labour power, the key resource involved any any type of production can’t be stored. Its a case of use it or lose it at the time. A commodity like a book can be stored, at least for a certain period of time. But what about money? We might think that can be stored too. But can it really? I’ll come back to that at a later time! This entry was posted in MMT General and tagged Borrowings and Lendings, Central bank, Chartalism, Government debt, National Debt, Post-Keynesian economics, Quantitative Easing, Resources and Money. Bookmark the permalink. What a waste, that picture is so sad.